Urban Island Prototype 01 is a re-envisioned design that shuns the notion that a park needs to be on the ground. Citing the boom of population as his inspiration, <a href="//cargocollective.com/erickkristanto" target="_blank">Erick Kristanto</a> came up with the proposal for the <a href="https://inhabitat.com/the-green-at-college-park-is-the-first-certified-sustainable-sites-initiative-sites-landscape/" target="_blank">urban park</a> as an entry for the <a href="http://thenextfifty.org/urbanintervention/" target="_blank">Seattle Urban Intervention Competition</a>. Urban Island Prototype 01 <a href="https://inhabitat.com/nyc/low-line-park-under-delancey-street-launches-kickstarter-campaign/" target="_blank">reorganizes the traditional idea of public park space</a> in order to maximize its use, and the resulting space centers an array of activities on top of an elevated platform that provides shaded park space below. Kristanto designed the Urban Island in response to the idea that <a href="https://inhabitat.com/water-works-park-will-connect-residents-with-the-river-watershed-in-des-moines-iowa/" target="_blank">park spaces</a> are centered around objects as an attraction. Instead, Kristanto focuses on activities as the focus of the park, but rather than taking up precious grass space, he locates them above ground. 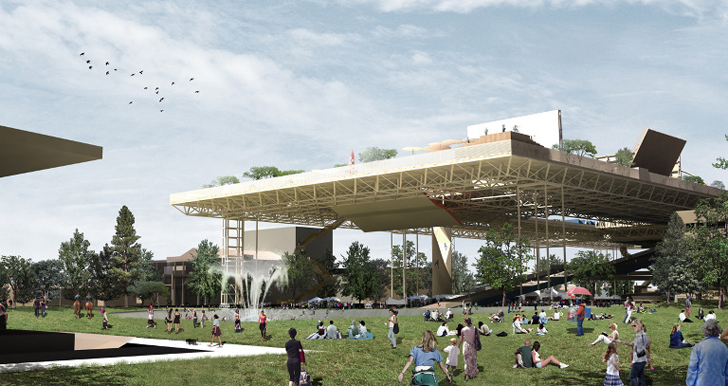 From afar, the elevated pavilion meshes with the existing <a href="https://inhabitat.com/steel-mill-converted-into-a-spectacular-public-park-in-luxembourg/" target="_blank">green park</a>. Grass and other greenery still grow below it, and small trees line the pavilion on two sides. 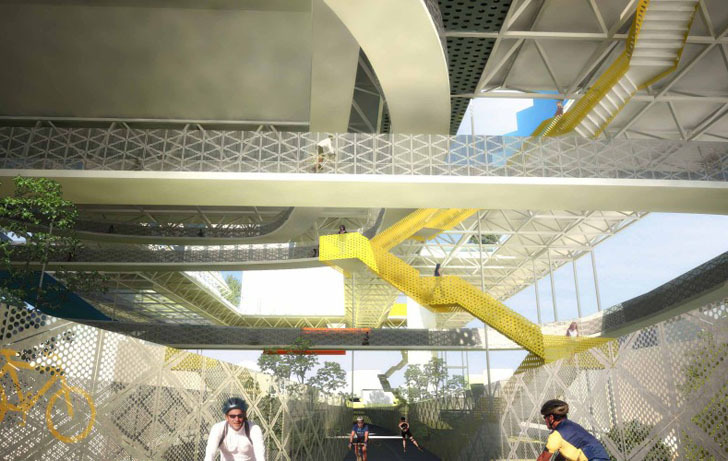 <a href="https://inhabitat.com/nyc/chinatowns-mini-high-line-to-be-designed-by-renowned-artist-xu-bing/" target="_blank">Atop the pavilion</a>, Kristanto has designed areas for sports, entertainment, swimming pool, cultural activities, education and room for shops or food vendors. A circular walking path runs around the edges of the upper pavilion, connecting each of the activity areas, as well as giving pedestrians stellar views of Seattle. Visitors can reach the platform several ways. A jogging ramp and a bike ramp accommodate those coming to the park for exercise, stairs for pedestrians and an elevator for the impaired. Both the <a href="https://inhabitat.com/nyc/hao-architects-win-coleman-oval-skate-park-redesign/" target="_blank">active ramps and the activities</a> can be used for circuit training, inviting active visitors to train for triathlons right in their local park. 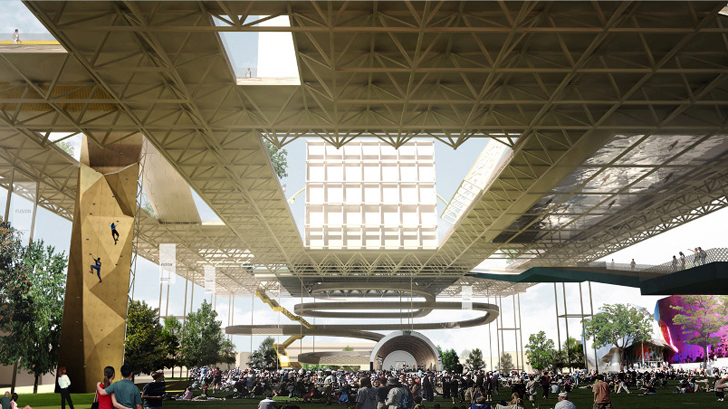 Below the platform, the <a href="https://inhabitat.com/nyc/emerging-new-york-architects-competition-unveils-the-winning-designs-for-the-harlem-edge-waterfront/" target="_blank">green park space</a> is maximized. The elevated platform is open in the middle, so that sun may shine into part of the grass below. 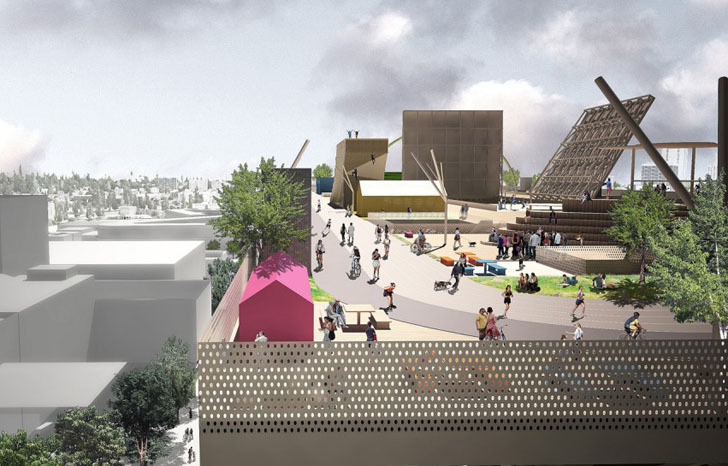 The park space will not be programmed, but instead open for lounging, strolling and relaxing without the interruption of the park activities above. By separating <a href="https://inhabitat.com/photos-cacheuta-thermal-water-park-is-a-summer-escape-wedged-in-argentinas-andes-mountains/" target="_blank">park activity from nature</a>, city dwellers are able to double their park space, benefitting from the cultural and exercise aspects, without giving up the coveted green space that many residents seek to replace their own lack of personal outdoor space. 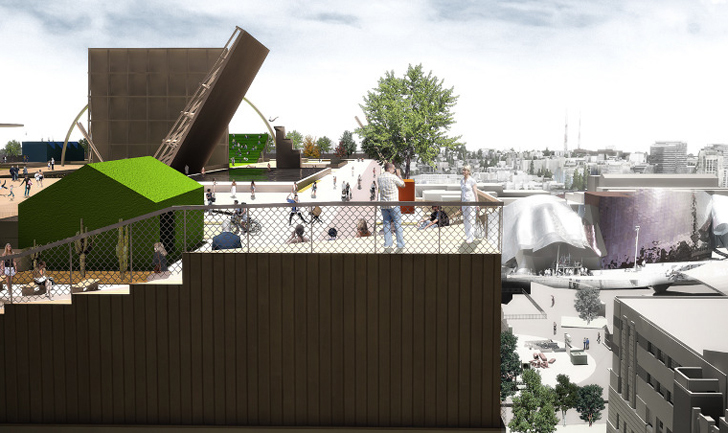 Urban Island Prototype 01 is a re-envisioned design that shuns the notion that a park needs to be on the ground. 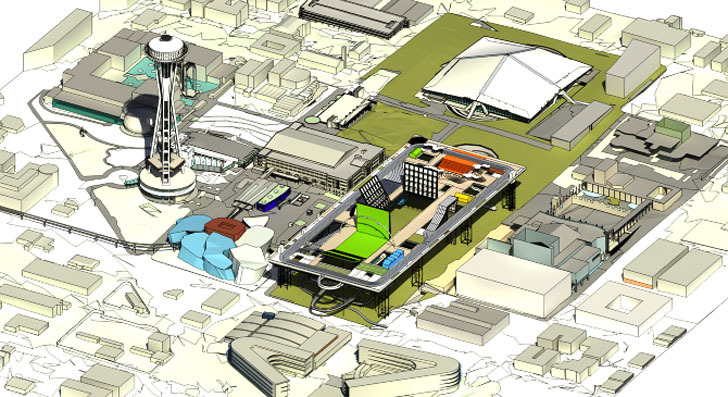 Citing the boom of population as his inspiration, Erick Kristanto came up with the proposal for the urban park as an entry for the Seattle Urban Intervention Competition. 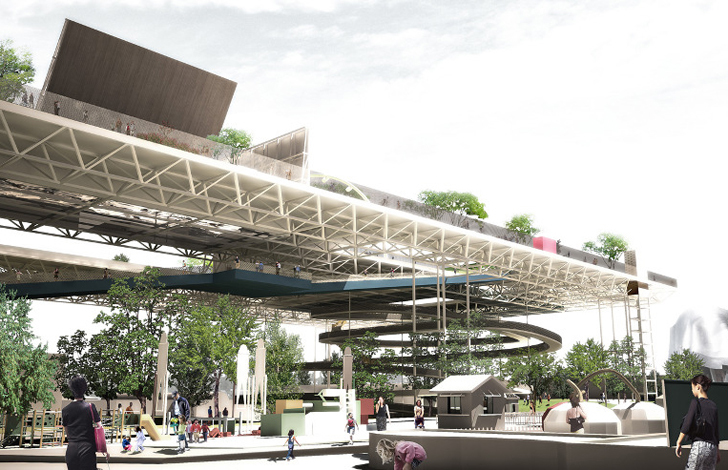 Urban Island Prototype 01 reorganizes the traditional idea of public park space in order to maximize its use, and the resulting space centers an array of activities on top of an elevated platform that provides shaded park space below.